When you’ve made the decision to do something about your hair loss, there are many things to consider. You want to find a permanent solution which means choosing hair transplant procedures rather than a medication that stops working if you don’t take it. You also want to avoid painful options like strip surgery which can be painful and require longer recovery times. You also want the healthiest and most natural looking head of hair possible, which you can find at RHRLI.We use the ARTAS® system, a state of the art procedure which employs robotic technology to give you a healthy head of hair. 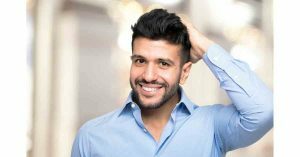 When you come in to discuss the ARTAS® FUE Hair Transplant Procedure, we’ll take you through each component of the process including hairline design. This is a critical part of making sure the result of your transplant looks natural and that you have a design that serves your needs. The International Society of Hair Restoration Surgery (ISHRS) outlined guidelines for patients who are considering the procedure. They suggest that you look for a doctor with a record of experience and results in designing natural looking hairlines. Among the suggestions they give about looking for the right doctor is to ask about their ideas and suggestions regarding hairline design, discussing how they will design a unique and personal hairline for you and making sure that you ask the doctor to provide before and after results. As for the actual hairline design itself, there are several things your doctor should keep in mind, according to ISHRS. Among the factors that need to be considered is the type of hair the patient has, for example, thin versus thick hair. They should also consider the curvature of the hair and the number of hair follicles. Because each design must suit the individual, the consultation is critical. At RHRLI, we will answer your questions and take you through every step of the procedure. We’ll incorporate your personal photographs into your hair transplant design. The doctor will draw a hairline and other markings directly onto the scalp to delineate the area to be transplanted. With the design in place, we’ll use the ARTAS® system’s robotic technology to identify donor hairs and transfer them with more accuracy than any other procedure available. RHRLI is the only hair loss specialist on Long Island that has the ARTAS® system. If you’re looking for a permanent solution to hair loss, contact us today.